Please note that the content of this book primarily consists of articles available from Wikipedia or other free sources online. 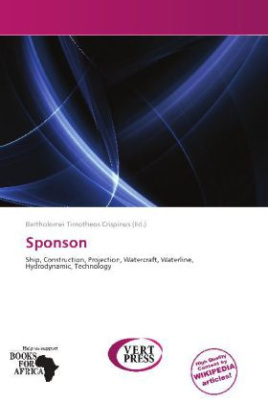 Sponsons are projections from the sides of a watercraft, for protection, stability, or the mounting of equipment such as armaments or lifeboats, etc. They extend a hull dimension at or below the waterline and serve to increase flotation or add lift when underway. Sponsons are commonly used on jetskis and other personal watercraft such as canoes to provide either additional buoyancy and thus stability against capsize, or hydrodynamic forces to resist capsize. They can often be easily attached to an existing craft in order to improve its stability. They are far less common on ships than such stabilizing means as pontoons, outriggers, and dual hulls due to their comparatively poor performance in stabilizing large hulls. Sponsons are sometimes added to improve stability when ships are modified.